EzDent-i Producing error "File Server does not work - Please check File Server. 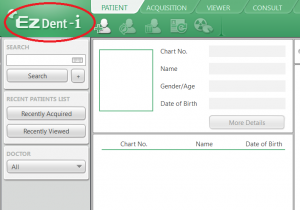 When this error occurs you might not be able to access patient images or save images to patient chart. The first thing we must do is identify where the File Server is located. In this section it is important to not make any changes to any configuration. This step is only to identify where the file server is located at. 2. Next in the drop down step 2 circled below click "Settings"
3. then press the "Database" Tab Step 3 circled below. 4. Finally you will be shown an IP address. 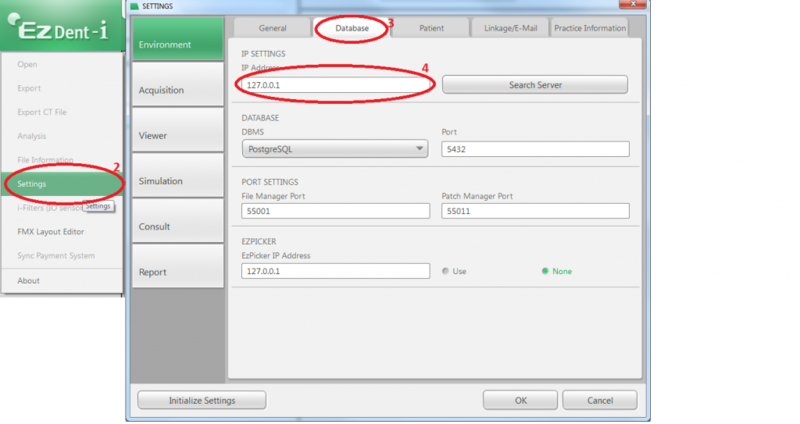 If this IP as shown in step 4 is 127.0.0.1 then the server is hosted locally on the PC. Continue to Step 7. If it is anything other than 127.0.0.1 continue to step 6. In this case you will need to contact your IT in order for them to connect and continue to step 6. 6. 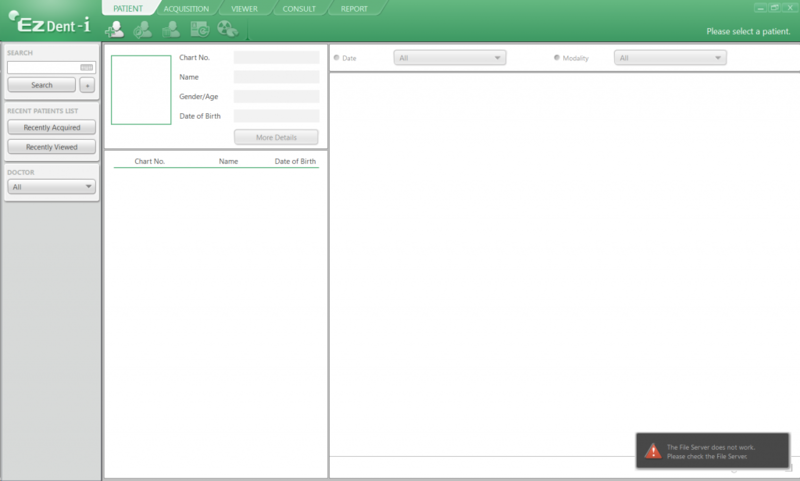 First - Determine if the Server/PC that hosts the SQL/VTFilemanger is logged in; typically for Servers; might restart or loose power; when they come back on they do not auto-logon so you might just need to login. 7. 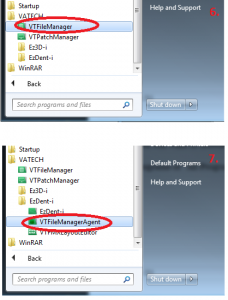 Once you have logged in if the issue is not solved then next you will want to browse to the Start Menu (Windows logo) typically located lower left hand corner of the task bar. Under Programs or "All Programs" locate the listing called Vatech. Here you should see a listing "VTFileManager" click this as shown in the below image. Please note that in case its already running you might get a notification its already running just click ok if you do. 8. Once both has been started exit EzDent-i and relaunch. You should not receive the message if both are running correctly in the system. If for any reason this does not solve the issue please contact support for further technical support. Notice: In some cases where the VTVILEMANGER32 is not able to run properly due to headless server or failure to run .exe at startup or system exit/crashing of the program; due to windows issues; patches; updates outside of our control; - as we do not support virtual or headless servers - 3rd party Run-as-service may be used to startup the EzServer's - VTFilemanager.exe however Vatech does not directly support their use as they are not manufactured by our company. Vatech recommends running the EzServer on a system capable of running the software as delivered by manufacture if at all possible. If the run-as-service has unexpected errors or issues Vatech suggests restoring to original VTFilemanager32 and running the program on a compatible system for stability.  On the bottom right of my screen there is a section that is flashing red.